Salad – Agro-industrial holding "ECO-culture"
Leaves of a green Aficion lettuce contain not only cellulose, irreplaceable for a human organism, but also a number of useful vitamins and vital microelements. Aficion lettuce has juicy and thick leaves. The taste is pronounced and not at all bitter. 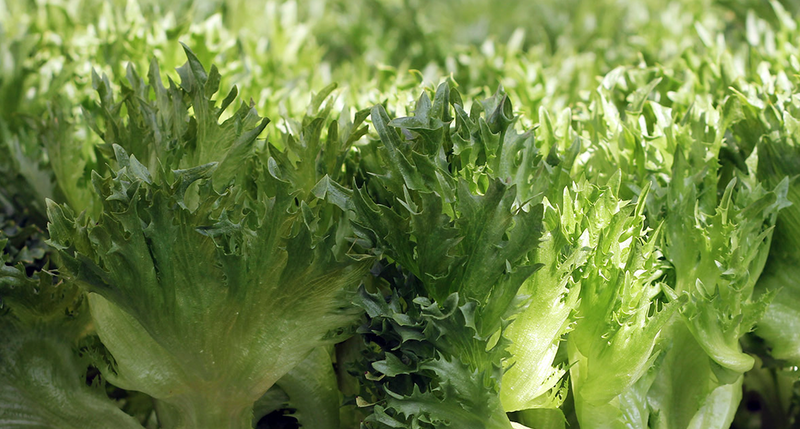 Thanks to the structure, the lettuce leaves are recommended element for a diet or therapeutical feeding. Besides, it can be a great way to add some freshness and health benefit to your salads, hot dishes, sandwiches, and other cold appetizers. During the production of the Aficion lettuce in the greenhouses of our agri-holding we use only natural methods of yielding stimulation and protection. All our products are tested by the sanitation services against content of harmful substances and declared completely safe and good for consumers of all ages. Green frillice lettuce is a plant with pointed ribbed leaves and excellent favour. Not only it contains a high level of vitamins and microelements, but also can boast of attractive presentation. It makes a perfect choice for cultivation in greenhouse conditions. The crunchy, juicy leaves of rich green color have a light note of sweetness. Can be used for cooking salads, hot dishes, sandwiches. Leaves are used quite often as a self-contained element of dish layout. The plant itself is easy to care for and has high prolificness rates. In greenhouses of Eco-kultura agro-industrial holding the lettuce is grown without the use of growth promoters or chemical fertilizers: our products are eco-friendly, safe and are in conformity with all established sanitary and hygienic requirements.